If you enjoy bringing welcome diversion into the lives of our hospital patients, have a sunny disposition and have just a few hours a week to give, we’ve got the perfect volunteer position for you! 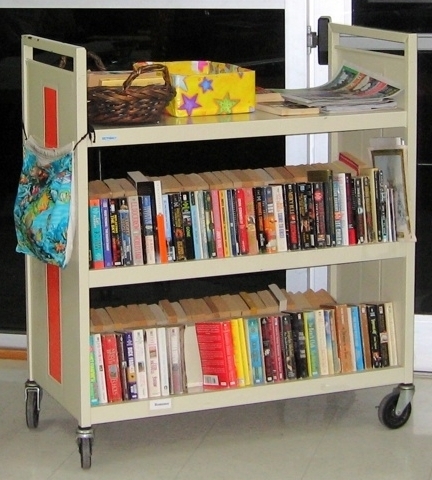 The Friends of the St. Thomas Public Libraries (FOSTPL) began rolling a sturdy/handsome book cart on several floors of the Roy Lester Schneider Regional Medical Center many years ago. Not only patients and staff avail themselves of the free paperback books and magazines, but often visitors who are keeping vigil with a loved one benefit also. Three days a week volunteers Beth Gembus, Judy Moore and Rosary Harper take the cart through the wards with magazines, some books, smiles and hearts full of joy. In spite of the addition of TV to every room the book cart is still viable and popular with many patients. The volunteers have valiantly continued the program that Margo Heikkila started, even though she has moved to the states. We applaud their dedication. The Hospital Book Cart program is seeking volunteers (a training program will be required, in compliance with regulations of the Roy Lester Schneider Regional Medical Center). Please email us to express your interest and for more information: helping@fostpl.org.